The Betweenlands is a mod developed by the Angry Pixel modding group. This large and expansive mod adds a whole new fully fleshed-out dimension with a plethora of exciting new content that offers an exciting and challenging survival experience. The Betweenlands dimension is a dark and mysterious realm where strange, monstrous creatures roam amongst the remnants of long lost civilisations that have succumbed to the spread of decay. As dangerous as it is beautiful, there is much to explore and discover. The player must learn of their surroundings and keep their wits about them or else perish. The mod is in active development, and many exciting new features are in the works. These will include new dungeons, bosses and a race of NPCs. During the time when the Overworld and Nether were just being born, this dimension existed as little other than a void of nothingness, but energy seeped into it, giving it potential to grow. Eventually, an interdimensional rift appeared, allowing life force to populate this dimension. A race of NPCs inhabited it, including a powerful Druid. He and his followers worked to twist the Nether's evil into a weapon of peace. However, when they opened the portal in this dimension, evil surged out into it. This caused the NPCs to become Wights. The druid himself became the Prime Wight, and he now wielded power over this dimension. He caused the Betweenlands to become a swampy, deathly land, as it is now. After much time, a traveler (the player) found their way to the dimension. The air is so foul that any creature breathing it slowly decays. The realm has no day/night cycle. Clocks, maps, redstone, flint and steel, and compasses are useless here. Due to the warm and wet environment of The Betweenlands, food from other dimensions rots when traveling through the portal to this dimension, becoming Rotten Food. As Flint and Steel cannot operate in the dimension, there is an alternative way to creating a fire. Simply hold right-click Moss, Cave Moss, or Thorns (either placed or dropped, both block and item forms work) with an Octine Ingot to light it on fire. The ingot will cause the plant to slowly build up flame until it turns into a fire block, without consuming the ingot in the process. This is essential for getting an Infuser started. Torches will not work here, and you will require Sulfur Torches instead. Along with that, tools from other dimensions will be diminished in effectiveness in the Betweenlands, prompting the player to use the Betweenlands tools. However, Betweenlands tools in your inventory will undergo Corrosion. The Betweenlands can be accessed by creating a Portal Tree, which contains four portals to the dimension. For more information on how to access the dimension, visit the How to get there page. 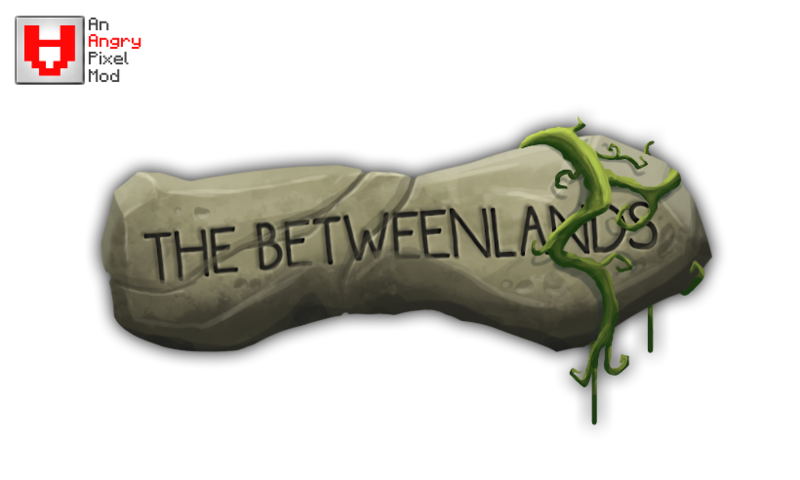 The Betweenlands revolves around a swampy-like theme. It has a randomly generated, animated green sky dotted with mysterious, hazy stars. These skies have Auroras from time to time, one of the last sparks of happiness in the dimension. The once verdant soil retains a very dead green color. The dimension is composed of Swamplands, Patchy Islands, Coarse Islands, Sludge Plains, Deep Waters, and Marshes. The Middle Gem Ores can be found within a couple of these biomes. These biomes are crawling with very thick and uncontrolled flora and fauna, and some contain remnants of long lost civilizations in the form of Small Ruins, Dungeons, and Idol Head Statues, among other mysterious structures. There is one rare major dungeon landmark, the Wight Fortress, that is central to progression. The Betweenlands may give birth to new biomes in the future and will receive more structures, such as Tribe Settlements. The Lake Caverns, or Pitstone layer of The Betweenlands. It houses Valonite Ore, and Life Crystal Ore. The Betweenlands's default tree is the small Weedwood Tree, although there are bigger variations. The dimensions also provides Sap Trees, Rubber Trees, and Dead Trees. More trees are to come in the future. The dimension carries a whole underground system with ores such as Sulfur Ore,Slimy Bone Ore, Octine Ore, Syrmorite Ore, Valonite Ore, and Life Crystal Ore. The caves themselves are often wide and house underground flora and dripping stalactites, along with echoing cave ambiance. There are two main locations of the Betweenlands's underground structure: The Caverns and the Lake Caverns. The Betweenlands only has two underground structures at the moment, and those are the Tar Dungeon, located in the Caverns layer, and the Underground Ruins, located in the Lake Caverns layer. Ancient Temples and more will be arriving in the future. Lots more information, as well as lengthy, in-depth guides for the mod, can be found on the official wiki, and you can follow @BetweenlandsDev on twitter for updates on development. We also have an official Discord server for The Betweenlands where you can hang out and maybe chat with the developers (we're usually around). Come drop by and say hi! My screen is totally black! This is a common issue when OptiFine is installed. The "Fast Render" option in OptiFine causes our shaders to not work. or disable the Betweenlands shaders in the Betweenlands config. Download the latest recommended version of Forge. instead of restarting the game. This mod makes my game lag horribly!!1! USED TERMS MOD - modification, plugin, a piece of software that interfaces with the Minecraft client to extend, add, change or remove original capabilities. MOJANG - Mojang AB OWNER - , Original author(s) of the MOD. Under the copyright terms accepted when purchasing Minecraft (http://www.minecraft.net/copyright.jsp) the OWNER has full rights over their MOD despite use of MOJANG code. USER - End user of the mod, person installing the mod. LIABILITY THIS MOD IS PROVIDED 'AS IS' WITH NO WARRANTIES, IMPLIED OR OTHERWISE. THE OWNER OF THIS MOD TAKES NO RESPONSIBILITY FOR ANY DAMAGES INCURRED FROM THE USE OF THIS MOD. THIS MOD ALTERS FUNDAMENTAL PARTS OF THE MINECRAFT GAME, PARTS OF MINECRAFT MAY NOT WORK WITH THIS MOD INSTALLED. ALL DAMAGES CAUSED FROM THE USE OR MISUSE OF THIS MOD FALL ON THE USER. USE Use of this MOD to be installed, manually or automatically, is given to the USER without restriction. REDISTRIBUTION This MOD may only be distributed where uploaded, mirrored, or otherwise linked to by the OWNER solely with the exception of CurseForge modpacks. All other mirrors of this mod must have advance written permission from the OWNER under the joint agreement of the Angry Pixel modding group. ANY attempts to make money off of this MOD (selling, selling modified versions, adfly, sharecash, etc.) are STRICTLY FORBIDDEN, and the OWNER may claim damages or take other action to rectify the situation. In any cases, full credit to the Angry Pixel modding group must be given. DERIVATIVE WORKS/MODIFICATION This mod is provided freely and may be decompiled and modified for private use, either with a decompiler or a bytecode editor. Public distribution of modified versions of this MOD require advance written permission of the OWNER and may be subject to certain terms. Use of small sections of code is allowed as long as the result is transformation. The code may also be viewed and learned from for educational purposes. The Betweenlands mod has a comprehensive team of talented people behind its creation. Their development team is called Angry Pixel. Aginsun, Cricket, Daveyx0, FairWolf, Fish2, Hologuard, Hwd45, Iridium616, Ivorius, KazunariAkito, Laskeri, Quintinity, RandumbDude, Robonix, Sagotomi, Sartharis, Stealthgert, Vazkii, ZeuX, calebmanley, kiko0804 and probably many more! All of the dedicated fans who showed their love and support for this project during its development. We couldn't have done it without you!